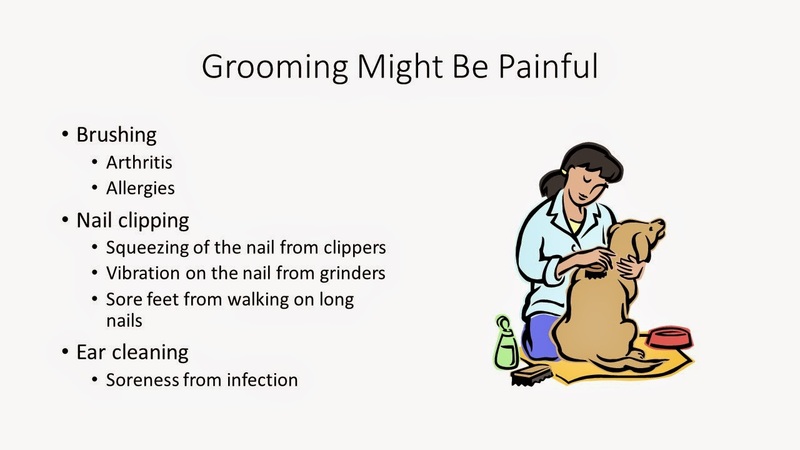 If your pup continues to have problems with grooming, talk to your allopathic/conventional vet or your holistic vet about a pain assessment or maybe even some remedies or medications that might help alleviate pain. If pain management doesn't seem to help or if pain doesn't seem to be the issue, sometimes pets need a bit of support to go along with counter conditioning and desensitization - especially those pets who have generalized anxiety or those who have been through a trauma. Talk to your holistic vet about remedies for anxiety or talk to a board certified vet behaviorist about situational and/or long term anxiety medication. Be sure to do you own independent research about what ever medication is prescribed. Some vets still prescribe acepromazine (ACE) which can the problematic for many dogs. For other countries right to the folks at the above link for a list for your country.